A 5 minute video of a selection of my paintings now on YouTube. Grab a cuppa or a glass and follow the link. Music by my son Edward Cornish. Prints and a selection of my paintings are available from www.fineartamerica.com. 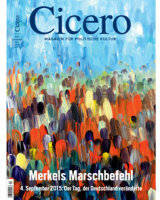 CICERO magazine in Germany chose my painting Exodus for it's front cover as part of an article on the refugee situation there. Limited edition prints of EXODUS available. A selection of my paintings for sale are on permanent display at The Galley Cafe, The Pannier Market, Bideford. Open Tue - SAT 9:00 - 16:00.